Formula 1 season has started again and I am very excited for the season. This year will bring a race to the US for the first time in a long time. While we were on off season, Lewis Hamilton and Tony Stewart got to swap cars for a publicity event. NASCAR and F1 meet. I find this pic hilarious because it shows the different skill levels of the drivers. 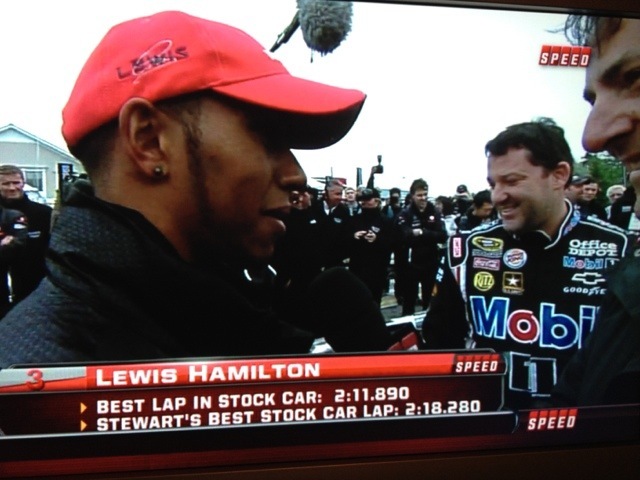 In this photo you can see how Lewis Hamilton kills Tony Stewart’s lap time in Tony Stewart’s own stock car. Just because they were racing at Watkins Glen where there was actually a real racetrack. Yeah, I said it. NASCAR isn’t real racing. Apparently having more than 1 type of turn in a course threw off the NASCAR driver. And a F1 driver was able to finish a whole 7 seconds faster per lap in an unfamiliar car. Surprised the announcers didn’t make a bigger deal of this. Seriously had me laughing at Tony Stewart after I saw this. Here’s to a great F1 season in 2012. You are currently browsing the archives for the F1 category.